The Frigidaire FAQG7072LW gas dryer comes in a superb 7.0 cu. 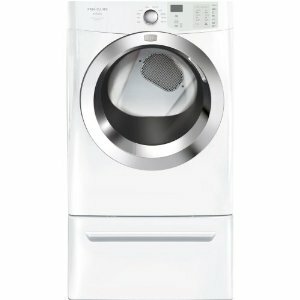 ft. capacity and is fitted with useful features such as DrySense and EnergySaver. The DrySense Technology carries out complete and precise drying results through moisture sensors that match the necessary heating levels with the moisture levels contained in the drum. And with the Energy Saver option of this dryer you can enjoy up to 35% savings in your energy consumption. With its 7.0 cu. ft. capacity, the FAQG7072LW is one large capacity gas dryer among its class. This Fits-More Dryer allows you to dry huge batches of laundry in just one go. Its TimeWise Technology leaves you no time to wait for your laundry to dry since wash time is equivalent to that of dry time. The DrySense Technology leads to precise, even, and complete drying of your laundry, without the wrinkles, which is a common sign of overdrying. Since this dryer is NSF certified and with its Sanitize option, you only get 99.9% bacteria free laundry out of your dryer. The SilentDesign feature keeps noise and vibration to super low levels, resulting in a noiseless drying operation. The EnergySaver option allows you to save up on your energy consumption by as much as 35 percent. The Save your Settings feature saves your last settings immediately so that drying your laundry the next time around will be more convenient. This dryer is available in 4 different colors, specifically Classic White, Classic Silver, Classic Red, and Classic Blue. The Express-Select Controls make it easy for anyone to click on the right settings or options prior to each cycle. The Cycle Signal Lights results in easy monitoring of each cycle, especially if the drying cycle is still on-going. Choose the drying level you prefer from among 5 selections, such as Damp Dry and More Dry. Several features of this dryer are built for your convenience, such as the Control Lock, Drum Light for easy visibility, and Timed Dry option. Completey and evenly dry your laundry without concerns on overdrying or underdrying through the DrySense Technology of this dryer. Ensure that your laundry is refreshed and bacteria-free by as much as 99.9%, as this NSF certified dryer comes with the Sanitize temperature setting. Save up on your energy consumption as the Energy Saver Option allows you to save on energy use by as much as 35 percent. Dry your laundry without having to disturb the peace in your household, as the SilentDesign feature of this dryer keeps noise and vibration to a minimum. One convenience feature which this gas dryer lacks is a dry rack, which is normally used in drying items other than regular clothes. This dryer has not earned an Energy Star rating or a CEE rating. This dryer does not have a steam feature, which is useful in reducing wrinkles and in preventing static cling while drying. however... no dryers are Energy Star rated, check it out for yourself.